• High sensitivity and wide linear range. Use 20 μL sample. 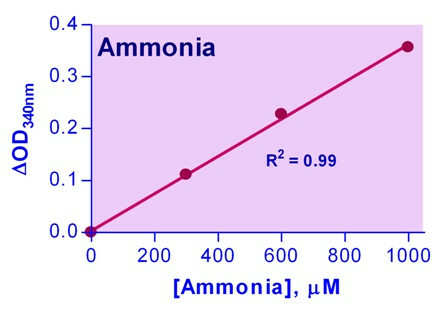 Linear detection range 24 to 1000 μM ammonia. • Homogeneous and simple procedure. Simple "mix-and-measure" procedure allows reliable quantitation of ammonia within 30 minutes. Ammonia (NH3) or its ion form ammonium (NH4+) is an important source of nitrogen for living systems. It is synthesized through amino acid metabolism and is toxic when present at high concentrations. In the liver, ammonia is converted to urea through the urea cycle. Elevated levels of ammonia in the blood (hyperammonemia) have been found in liver dysfunction (cirrhosis), while hypoammonemia has been associated with defects in the urea cycle enzymes (e.g. ornithine transcarbamylase). Simple, direct and automation-ready procedures for measuring NH3 are popular in research and drug discovery. BioAssay Systems’ ammonia assay is designed to directly measure NH3 and NH4+. In this assay, NADH is converted to NAD+ in the presence of NH3, ketoglutarate and glutamate dehydrogenase. The decrease in optical density at 340 nm or fluorescence intensity at λex/em = 360/450 nm is directly proportionate to the NH3concentration in the sample. Applications For quantitative determination of ammonia/ammonium concentration. References Assay: Ammonia in Mouse Cell Culture Media (Pubmed). 2. Nunez, EGF et al (2014). Influence of aeration-homogenization system in stirred tank bioreactors, dissolved oxygen concentration and pH control mode on BHK-21 cell growth and metabolism. Cytotechnology 1-13. Assay: Ammonia in Hamster Kidney Cell Line (Pubmed). 3. Wang, L et al (2015). CtBP maintains cancer cell growth and metabolic homeostasis via regulating SIRT4. Cell Death and Disease 6: e1620. Assay: Tumor Tissue in Mice (Pubmed). 1. Rauner, G et al (2013). Development of Foreign Mammary Epithelial Morphology in the Stroma of Immunodeficient Mice. PloS one 8.6: e68637. Assay: Ammonia in Mouse Cell Culture Media (Pubmed).